Summer 1863. The Confederacy pushes north into Pennsylvania. Union divisions converge to face them. 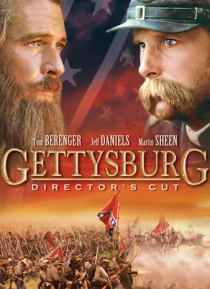 Two great armies will clash at Gettysburg, site of a theology school. For three days, through such legendary actions as Little Round Top and Pickett's Charge, the fate of "one nation, indivisible" hangs in the balance.